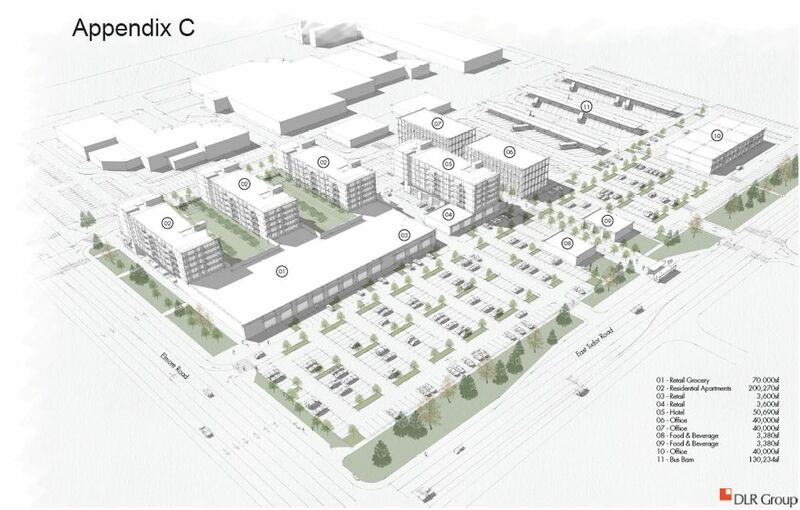 What started as a hunt for a new building for the Anchorage health department has evolved into what may be one of the city's most ambitious development deals to date — one that could install a grocery store, a hotel, apartments and offices on East Tudor Road, and an apartment building for seniors downtown. Land swaps, tax breaks and other concessions are pieces of an intricate proposal stitched together in recent months by the administration of Anchorage Mayor Ethan Berkowitz and two developers, David Irwin and Mark Lewis. Under the terms of the proposed deal, a new building for the Department of Health and Human Services would be built on vacant city land at Tudor and Elmore roads. It would replace the outmoded, crumbling clinic at Eighth Avenue and L Street downtown, which opened as a hospital in the 1960s and now needs extensive maintenance or renovations, officials say. But that's a small piece of a $180 million proposal that could dramatically transform a heavily trafficked East Anchorage intersection just south of the university and medical districts. • Redevelopment of about 13 acres of city land at 3500 Tudor Road into a vast complex with a 70,000-square-foot grocery store, a hotel, apartments and condos, medical offices, shops and restaurants. 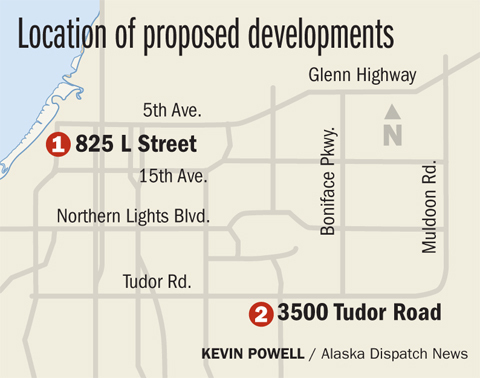 • A new building for the city health department would be built at the west end of the Tudor property, as well as a new bus barn for the Anchorage School District. Right now, the land is mostly vacant, serving as a barn for school buses and as a motorcycle training facility. The city's building offices are nearby. • At Eighth Avenue and L Street downtown, the old city health department building would be torn down. In its place, the developers are proposing about 120 apartments for seniors (55 or older), with rooftop patios and solar panels. 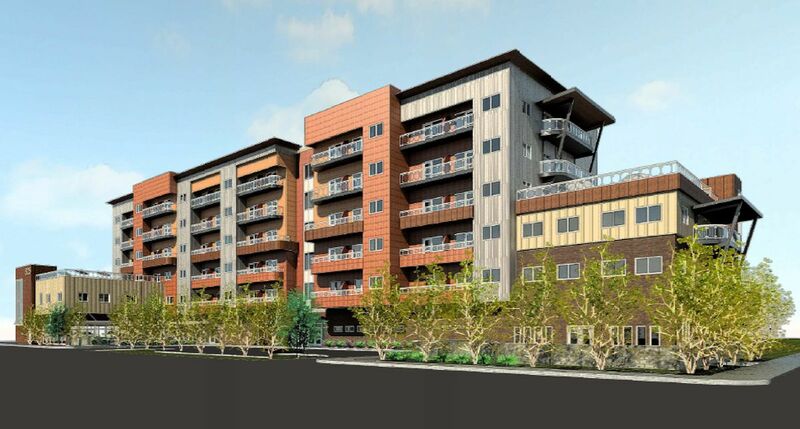 The apartments would be part of a complex that would include a small pharmacy, a cafe and bistro and retail shops, according to the design plans. The developers and the city plan to hold a public open house on the proposed project at 6:30 p.m. Wednesday in the training room of the city permitting building at 4700 Elmore Road. The proposals stem from a 2016 request from the city for a land swap involving the old health building. Over the past nine months, city officials and the developers have been negotiating the agreement. The developers have paid close to a half-million dollars in design and consulting fees, said Chris Schutte, the city development director. Some creative financing will be involved to make the developments happen, the documents indicate. The developers are seeking a five-year property tax break. If approved by chief fiscal officer Robert Harris, the tax break would amount to $8.2 million as a partial payment for the new health building. City law allows for the tax break because the properties in question haven't been taxed before, said Robin Ward, the chief housing officer for the city and a longtime public real estate manager. Other concessions from the city, like the land swaps and a new sewer line, would cover the rest of the construction cost for the new health building, according to the documents submitted to the Assembly. Ward said she still needs to identify a funding source for some of the concessions. The Assembly has to give the city permission to enter into the development deal for it to move any further. Many more details have yet to be worked out, including traffic studies, Ward said. Ward compared the proposed project to the massive Tikahtnu Commons retail development in Muldoon. But in that case, the city wasn't involved. The hundreds of new housing units promised by the project line up with a push by the Berkowitz administration and business groups to build more places for people to live, particularly millennials and seniors. In a conference room Friday morning at City Hall, developers Irwin and Lewis used large posterboards to illustrate the project. They were joined by Anchorage architect Tom Livingston, who is designing the L Street senior housing project and the grocery store complex on Tudor Road. Anchorage-based RIM Architects is the designer for the new health building. Irwin is a Washington-based developer who has been involved in large retail projects in Anchorage, including the Glenn Square Mall. He said he'd already been eyeing the Tudor Road property when the city's bid documents came out. "People in this town drove by this site every day and didn't think of it," Irwin said. "It just was that perfect match of timing and the city administration." Lewis is a former commissioner of the Alaska Department of Community and Regional Affairs under Gov. Bill Sheffield who served as the city manager of Valdez when now-Gov. Bill Walker was mayor. He now runs Alaska Pacific Development, which has offices in Anchorage and in Reno, Nevada. This is his first project in Alaska, he said. The developers had submitted separate responses to the city's bid for a land swap involving a new health building. Each had their own strong points — Irwin was focused on the Tudor Road property, and Lewis had pitched the senior housing project. But there was a united sentiment among city officials: "I just really want them both," Ward said. "Let's see if we can figure out how to have them work together — this is the best of both worlds." The Assembly is slated to hold a work session on the proposal later this month.